Although I'm not the most artistic person, I enjoy the exploration of different craft mediums. In fact if I get to combine a few of my favorite techniques and products, I am all about trying new things. The Crafter's Workshop is "a family-owned, independent manufacturer & distributor of some very cool templates and stencils" according to their website. Having worked with some of Julie's templates before, I was excited to try out some new designs for some scrapbook pages. Ease of Use: These templates come neatly packaged and are extremely easy to use. I chose to use a combination of mists and ink pads, although paint and other mediums could work well too. Usefulness: The materials seem to be extremely high quality. I was able to simply rinse them under warm water to clean them. Cost effectiveness: Because these templates can be used over and over again, I think the price point is very reasonable. - I liked the simple designs which created a nice background to plain cardstock. - I liked quality of the template and how easy it was to use with mists. - The potential seems limitless when it comes to these templates. I barely scratched the surface with my projects. What do you think? 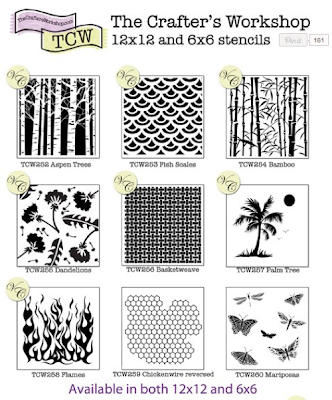 Although I love the look of the mists on paper, I am looking forward to trying these templates with paint. What do you think about these templates and do you have innovative ways of using them? Leave a comment by Sunday EST and be entered to win a prize pack from The Crafter's Workshop! US residents only. Be sure to include your email address so we may contact you if you win! I've seen the stencils at work and they sure look fun and easy to use. I have a good mind to try them on layouts and cards definitely with mists, distress inks and stains. These stencils definitely look easy and fun to use. I've never considered stencils like these for paper crafting. Thanks for sharing! I really like the one I have. I've used it with distress inks or as a stitching template. Thanks for the chance to win! I've been wanting to try these with mists. Thanks for the chance to win. Beautiful! Those stencils are on my wish list forever! Probably to long!Thanks for the chance to win! These are great! I love the ides of using mists on them, but also just tracing the design with a pen and then coloring in/painting, or using a paste to create a raised impression - I've gotten a lot of these ideas from Julie Blazer's blog. Thanks for the chance to win! Beautiful layouts! I would love to try out these stencils! LOVE the stencils from The Crafter's Workshop!! Love the scalloped one so much and amazing samples Amy. Makes me want to go paper craft instead of clean the house today, lol! So many fun techniques to use with them and would LOVE to win. I have a few of the templates, but I just use them for spritzing... I love the aspens and several others!!! Thanks for a chance to win! I've been admiring their stencils for awhile, would be fun to try! Can't believe you would say you're "not the most artistic person"! Love your creativity!!! These are absolutely beautiful layouts! I love how you used multiple colors! I love how you used the stencils for these layouts. It made the layouts truely homemade. Love them. I would love to see them with paint also. 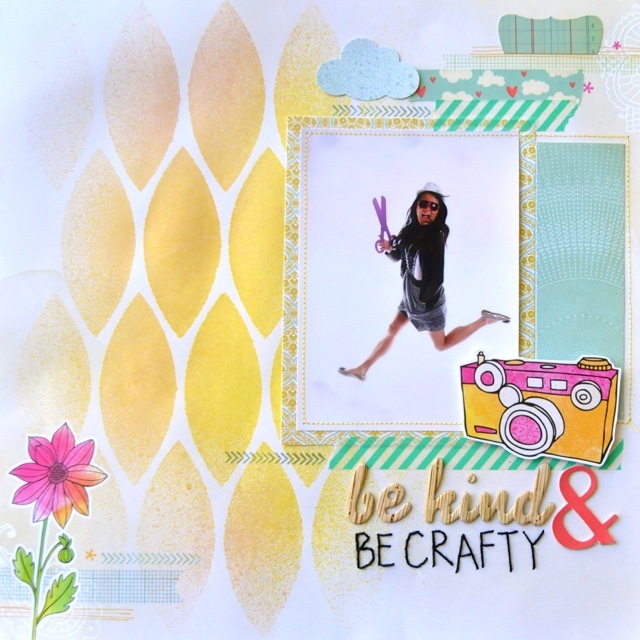 I love the pages you made with the stencils- they do look like the would be fun to use. Amy.... your layouts are awesome. I love the masks for the Mr. Hueys... I think I need some of these! Absolutely want to try these out. I want to learn some masking techniques. I keep checking these out in the store before deciding against them. Your review has me thinking I need to go get some! Thanks! And thanks for the giveaway! The layouts are great! I've only used them with mists so far. I've done layouts, cards, and tags. I would love to learn some of the other techniques that can be used with them. Love these layouts! 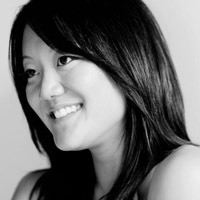 Especially the one with an ombré color wash. Lots of great ideas from Amy Tangerine. I love The Crafter's Workshop Templates and love how you used them. Copic Airbrush system works well with them and so do old school palette chalks! These look so fun! I haven't seen these locally - Love the Aspen trees and chicken wire patterns! 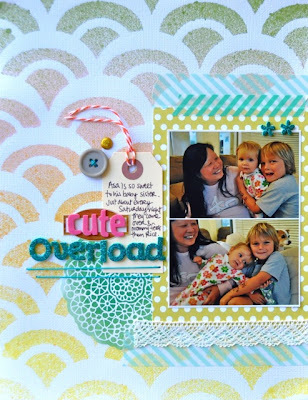 Beautiful projects with the templates, Amy! I just love the stencils from Crafter's Workshop, have several of them and more in the mail. Love using in combination with both mist and ink pads. I've used acrylic paint and molding paste. The last was a great experience!! I have three Crafters Workshop Stencils and LOVE them! You will really enjoy using them with paint. Love all of Crafter's workshop stencils. They have yet to disappoint me and they make me feel artsy. I have not used stencils before, although I would love to try them with mists, first, and then go on from there! have been waiting for someone to come up with a great masking product for mists! love these! would absolutely love to win some! i would use then with paint and mists for sure! Would love to try them with chalk and distress ink! Love love love Crafters Workshop Stencils! I believe you can never have too many of them! Love those layouts, Amy! I've taken a couple of Julie's classes online and LOVE her stencils!! Thanks for the chance to win! the best stencils out there!! i swear!! I've even used them as template for handstitching before! Great layouts! Nice review! I would love to try some of Julie's stencils! I adore Julie's stencils. I am drawn to your first layout and I think that leaf-like stencil would be perfect for some fall-themed pages. Thanks for the inspiration! I love these stencils, I have a few but none of the new ones. I would love to be able to have a chance to use them. I have some of these stencils so I know how fun they are. My favorite use is with spackle. My email is serra.ap.owen@comcast.net. Thanks! I have only tried small stencils but I love the idea of the larger ones. They would be great for layouts I would love to try using some ink pads to combine some colors. I have a few of CW's stencils and now I wish I had more. :) They work really well with distress inks. I would love to try these they look like alot of fun. 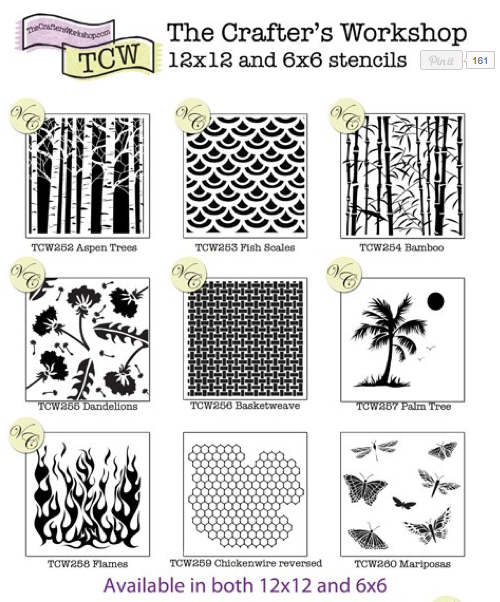 I don't have any of these stencils but would like to try them. These stencils are the best! Love what you I'd with them! Whenever I see these, I wonder what I'd do with them. They look so simple, yet make GREAT designs. I liked your samples, and your insights. I'd love to try these designs! Great layouts! Loved how you used them! Love using stencils with paints in backgrounds for journal pages. I love stencils and they are my weak spot in my craft budget - can't get enough of them! I mostly smear paint through the openings with a credit card or dimensional paste with a palette knife. But recently I learned a reverse stenciling trick from Dina Wakely where you rub paint off through the open spaces - it's very cool! I love stencils! Modeling paste is a fun medium to use with them. Just thinking of all the things I could create with the stencils is overwhelming. Would love to win. Thanks for the opportunity! Love these stencils! I have only one so far but want and NEED all of them, lol!!!! I think these are the best stencils around. Love both sizes and hope to win some! I think those templates are awesome! I can see myself using every single one of them. I like what you did with them too! I love using stencils and love crafters workshop ones! thanks for the ideas and the chance for some goodies. I'd love to use these with mists! Love your layouts! i love the balzer design stencils. i like to mist them too. also like to make outlines with colored markers and then paint the design with transparent ink in a sort of messy, graffiti way. LOVE what you did with the stencils. Your layouts are beautiful. I've just started using stencils--with both mist and paint. I definitely need more! BEYOND Awesome! I would love to get messy & get my mist/paint on! !